Holy smokes! It's back and bigger than ever for your skating pleasure. 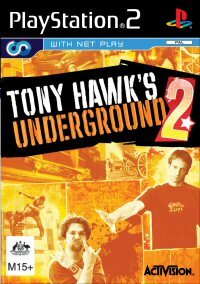 Each year I cannot wait for the latest Tony Hawk title from those legends at Neversoft and every year they don't disappoint me. Here's what I thought of the latest incarnation of the title. For starters, this game is big folks, really big. So big that it needed two teams of skaters to compete against each other in a World Destruction Tour! Team Hawk and Team Margera are traveling the world racking up points and the loser is gonna have to pay the travel bill! Levels are really well thought out and asides from a bit of problems with regards to drawing distance and animated objects, this game is one sweet looking beast. One other thing to look at is the character editor. I was able to make a replica of myself very readily to the point my three year old thought it was great that her dad was in a skating game when she saw it. There are two ways that you can play this game; either in Story Mode where you'll follow the general storyline and be a part of all the excitement and action. The game sees the return of you playing yourself and your so called friend Sparrow from the first Underground with the difference now that you are both pro skaters and the other pros know who you are even if they don't necessarily think that highly of you. One of the things that surprisingly enough I was really looking forward to was skating as the pros in the game and not as myself. Sounds weird but the way I look at it was that I am probably never going to skate as good as these guys and to take control of the characters and their abilities was for me, simply sensational. All of the pros and celebrities that took part or feature in this title did their own voice work and the face mapping of all the characters is pretty much spot on throughout, which helps drag you even more into the fun of the storyline. During each level you need to find the pros on your team, special guests and secret skaters that will unlock more tricks and goals for you to do. By pressing the O button you can switch to the new character and then go berserk with him/her/it which is loads of fun. I prefer the Story Mode to the old fashioned Classic mode simply due to the fact that I want to explore the world I am skating in, not simply find my way around in a panic while the two minute timer ticked down. It's neat that it's back in the game however I'd play that after story mode if I was playing this title as a consumer rather than a reviewer. 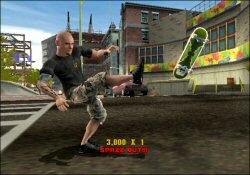 There are a number of new moves that have been brought into this game including stuff like the Barf Grind (discovered in Berlin when Bam grinds whilst in special and vomits on cops) and also the Natas Spin where you have to find Natas Kaupas who will teach you how to spin on fire hydrants and poles. It's a neat move and also pretty random where you'll get thrown off when you decide you want to get off the pole. Speaking of Natas, I just finished watching him do that spin in the old school DVD Santa Cruz movie Streets on Fire. 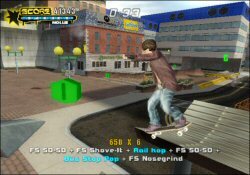 Some of the tasks in this game are going to annoy the heck out of the core skate crowd who might play one game only being this one. Throwing spray cans at taggers and other odd jobs won't win over these kids who are looking at that side of things however it's all good and a lot of fun. The tasks are varied and levels do lend themselves to some pretty sweet lines that you will need to find to get some great combo scores up. Another introduction that is brought in as actual gameplay (it used to be a cheat) is the Focus move where you get Special then hit L3. Everything slows down and you can see in amazing detail the level of animation that is in the game. This is a great way for you to learn how new tricks work and to get a better feel for the game in general. It's how I first picked up the best ways to rack up huge points doing manual combos as you can see how one flows into the next for the best effect. Not only that but it'll also let you see your points tallying up faster so you know what works when you are really going for it. If you are lucky enough to have broadband, take this puppy online for a bit of fun too as the game is designed for online play. I like to hook up a USB keyboard and chat as I go. There is a bit of lag in getting into a game and when new players join your server, however for the most part it is a lot of fun that will only stand to make sure that this game stays in your PS2 for even longer. We haven't reviewed the XBox version of this title and are not sure if it's online or not, though from what I've heard, it isn't. fun form that gamers can lose themselves in as a good little distraction as you play your way through an entertaining experience. Recommended.